The youngest half-goblin son of the Emperor lived his life in exile, distant from the Imperial Court. But when his father and the three sons in line for the throne die in an "accident," he must take his place as the only surviving heir. Entirely unschooled in the art of court politics, he has no friends, no advisors, and the knowledge that whoever assassinated his father and brothers could make an attempt on his life at any time. Surrounded by sycophants eager to curry favor with the naive new emperor, he can trust nobody. Amid the swirl of plots to depose him, offers of arranged marriages, and the specter of the unknown conspirators who lurk in the shadows, he must adjust to life as the Goblin Emperor...vigilant against unseen enemies, lest he lose his throne - or life. 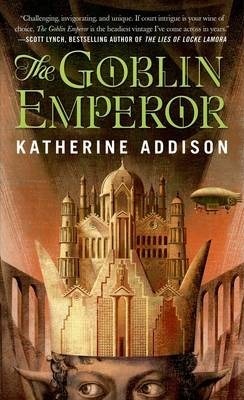 KATHERINE ADDISON's short fiction has been selected by The Year's Best Fantasy and Horror and The Year's Best Science Fiction. She lives near Madison, Wisconsin.